Clouds of brown and green sediment swirl through the North Sea in this true-color Aqua MODIS image acquired on December 18, 2004. The sediments are most concentrated in river outlets, most notably the Thames and the Mouth of the Humber on England’s southeastern coast. 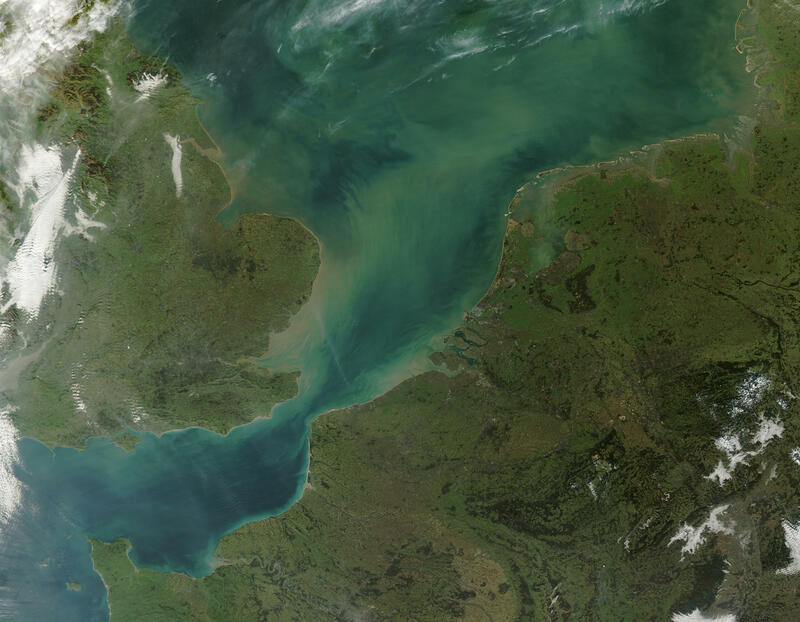 Within the larger body of the North Sea, the sediment is likely being pulled up from the sea floor, which lies no more than 50 meters below the surface. Large storms often stir up such sediment. Continental Europe dominates the lower right corner of the image. From lower left to upper right, the countries are France, Belgium, Luxembourg, the Netherlands, Germany, and Denmark. The sole fire in the image is marked in bright red, and burns northwest of Essen, Germany.